Not every notebook is going to blow your socks off, or even create any kind of sizeable sock-blowing breeze, for that matter. In the notebook space, you definitely get what you pay for, and in the lower price scales, the performance and build compromises you put up with can vary quite a lot. It's in this space that Acer pitches the Aspire E5 range. 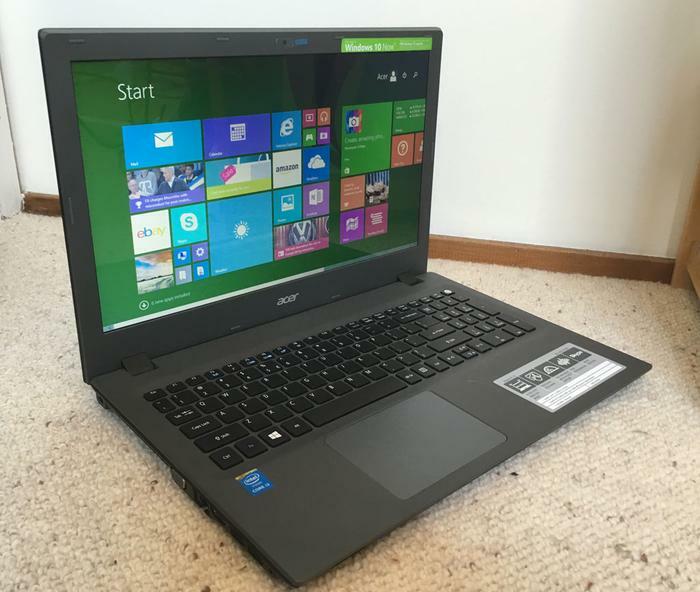 Acer sells the Aspire E5 in Australia in 15.6 inch and 17.3 inch screen sizes. Pricing locally ranges from $419 all the way up to $1599, depending on screen size and internal configuration, with a choice of Intel or AMD processors. The model supplied for review was the $699 15.6-inch, E5-573-3732 model, which ships with an Intel Core i3-5005U 2.0GHz processor, 4GB of DDR3 RAM and an internal 5400RPM Western Digital 1GB WD10JPVX hard drive. Graphics are via Intel's HD Graphics 5500 solution, further marking this out as an entry level machine, although some builds of the Aspire E5 do feature NVIDIA GeForce 820M GPUs. The display is a 15.6-inch, 16:9 1366x768 pixel TFT with no touch capabilities built in. The Aspire E5 is a budget machine in most configurations, and that shows in the design as well. It's a bulky unit at 32 x 382 x 256mm (HWD) and it weighs 2.7kg. Many mid-range units eschew fancy designs, but the E5 has a light brushed pattern on the top that tries to fool you into thinking it's a metal finish, rather than plastic. In terms of expansion, the left hand side houses VGA, Gigabit Ethernet, HDMI and two USB 3.0 ports, while the right hand side is where you'll find the power socket, a single USB 2.0 port and the DVD writer. On the wireless front, there's support for 802.11b/g/n, which is again, solid but unexceptional. The Aspire E5 ships with 64-bit Windows 8.1 preinstalled. Like any other Windows 8 machine, it's eligible for an upgrade to Windows 10 within the first year of Windows 10 availability. Acer preinstalls a fairly wide quantity of preinstalled apps, ranging from games to trials of security utilities that we suspect most users could easily do without. Not that you should eschew PC security, but that's a matter of making a more considered decision rather than relying on the limited trials provided with laptops. We found the keyboard on the Aspire E5 to be serviceable, with a few minor catches. The touchpad is centred underneath the space bar as you'd expect, but because the Aspire E5 includes a full number pad, this means it's significantly offset to the left, which requires a learning curve if you're used to a more centrally located trackpad. The cursor keys are well spaced apart, but the left/right keys are much larger than the up/down keys, which can be frustrating depending on your application usage. All additional functions are accessed via the function key on the lower left hand side of the keyboard. The Aspire E5's function keys are on the smaller side, and this feels like a bit of a waste. There's a lot of space above the keyboard that could accommodate larger keys, which makes them feel even smaller. The Aspire E5's screen was also disappointing for a lot of purposes, with a strong tendency to wash out at many sitting angles. It's technically HD capable, but movie watching on the Aspire E5 is very much a question of compromise. We found the inbuilt speakers to be equally ordinary for music or video playback. In benchmark terms, the Aspire E5 responded exactly as we expected it to, with somewhat sluggish performance results. It scored 3923 in 3DMark Cloud Gate, which means that its gaming prowess is usable for elementary purposes only. Any kind of heavy data activity tends to get the installed 5400RPM drive whirring and chunking along, but you'd again expect that from a notebook with modest specifications. The Aspire E5 managed a read score of 112.6MBps in CrystalDiskMark, and a slightly slower write speed of 109.8MBps. The one advantage you can get from a lower specification processor is less pressure on battery life. During our battery rundown test, in which we disable power management, enable Wi-Fi, maximise screen brightness, and loop a Full HD MP4 file, the Aspire E5's battery managed to squeeze out four hours and thirty-six minutes before finally conking out. The practical upshot of that is that you could realistically eke out a full day's work from the Aspire E5, as long as your needs were relatively modest. Given the carrying weight, it's hard to see too many Aspire E5 owners lugging it around for extended periods of time. The Aspire E5 is fair value for money, but that's pretty much all it is. If you just need a basic workhorse type of machine and can live with the offset trackpad in favour of the number pad there's some value here, but the competitive landscape at this kind of price point is particularly brutal, so it would pay to shop around.